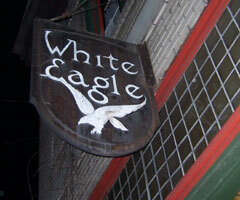 A rainy and relaxing Monday evening at the White Eagle. The Shivas from Vancouver, WA went on first and got things going. They are literally a High School band, but with a sound beyond their years. We followed with two sets including three debut songs: Waylit Jim, Voodoo, and A Forest (originally written by The Cure). Each set also featured extended jamming, particularly large sections of set two. Having James' brother Matt in attendance all the way from the East Coast, sealed the deal on a great night. I was just in the mycotopic site and found your link, my name is Timothy James and I am from Grand Rapids, MI. I look at the things going on in this world (the materialism, self-centeredness and the like) and can't help but think LSD needs to come back in full force. We all need to see once again, how we are all connected, and the world can be a beautiful place. Any way LOVE YOUR MUSIC.